Lock in a great price for Hostal Mapoula P.R. – rated 9.1 by recent guests! The location is very nice, just near the final stop of the bus coming from the airport. To every spot is also very close. This was a very clean and conveniently located hotel. Family owned.They made us feel very welcome. Have is lot of information about the area. The staff were very friendly. When I needed to make a room change, they were very friendly. Single room on third floor was nice. Nice shades. Rose in room was beautiful. Nice. Good location. 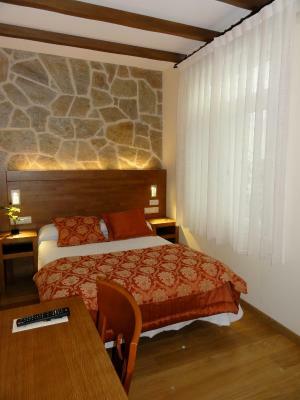 This s a stylish small hotel in an ideal location. It is in the old town, yet less than 100 meters to the modern city. 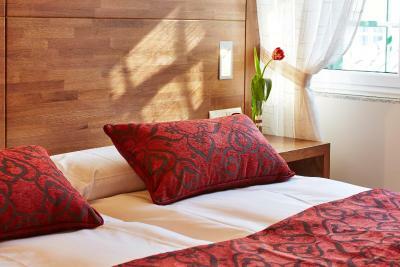 Our room had been recently renovated and was beautiful and comfortable. Windows were triple pane, so no noise. Staff were friendly. You can be at the Cathedral in five minutes. Location and breakfast. There is also an elevator. Location. Staff were very helpful. Good breakfast. Everything! 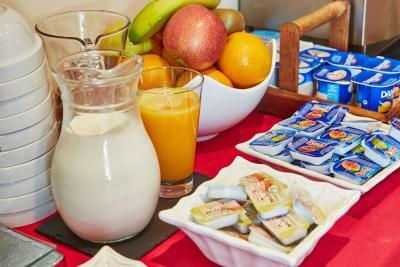 Since we were leaving early in AM, staff brought continental breakfast with coffee/milk in two thermos at 10:30pm. Was hot in the AM! 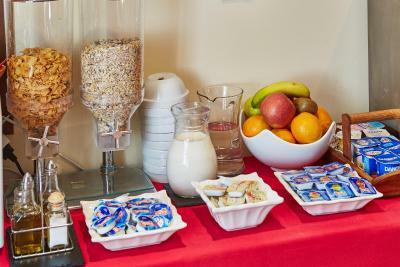 Clean, comfortable, warm reception, great buffet breakfast, even had soft boiled eggs available. 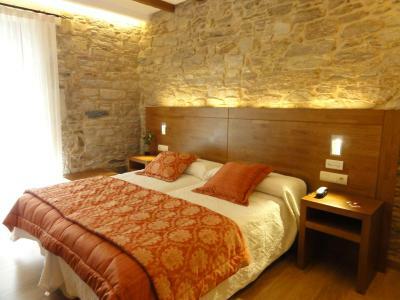 Located in a quiet part of Old Town, but still very close to shops, bars and restaurants. 5 minute walk to the Cathedral, 2 minutes to Alameda Park, 1/2 block to airport bus stop. Beautiful rose in room upon check-in. 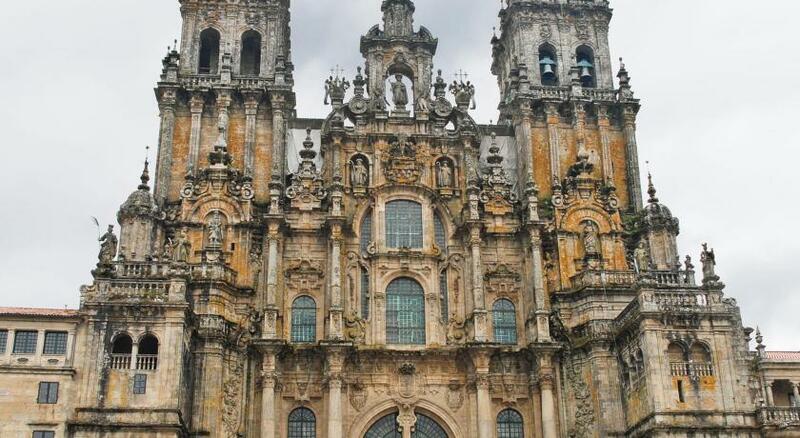 One of our best sellers in Santiago de Compostela! 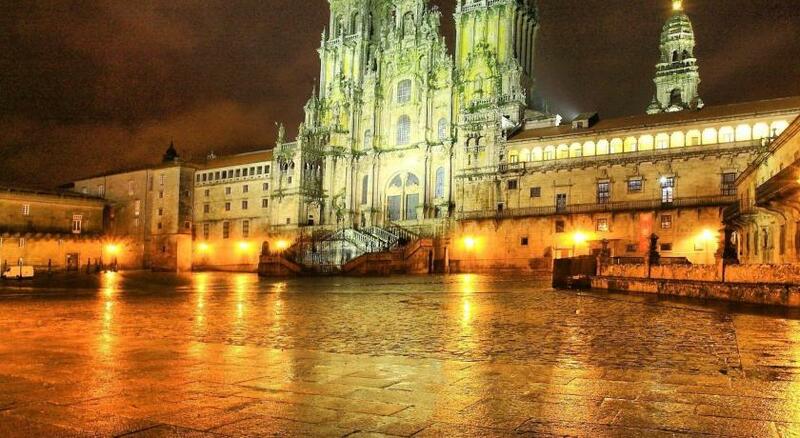 Hostal Mapoula is located in Santiago de Compostela's old town, just 1,500 feet from the Cathedral. 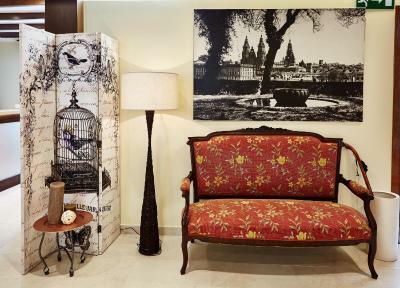 It offers a 24-hour front desk, free Wi-Fi and modern rooms with a TV. 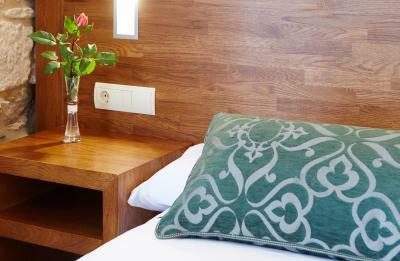 The Mapoula’s rooms feature parquet floors and cheerful colors. 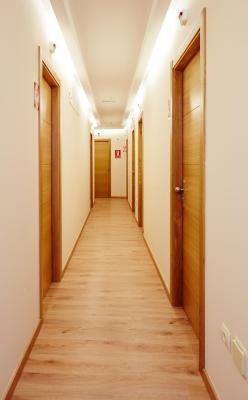 They are equipped with heating and come with a private bathroom. 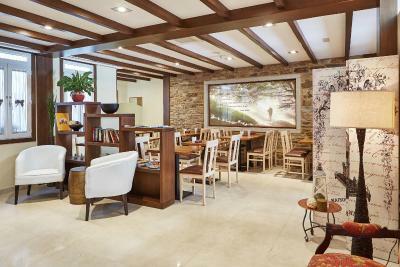 Staff at the guest house’s 24-hour reception can provide information about what to see and do in Santiago. You can also hire a car from the front desk. 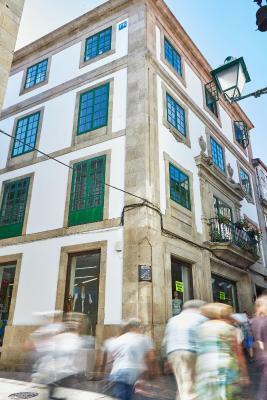 This property is also rated for the best value in Santiago de Compostela! Guests are getting more for their money when compared to other properties in this city. 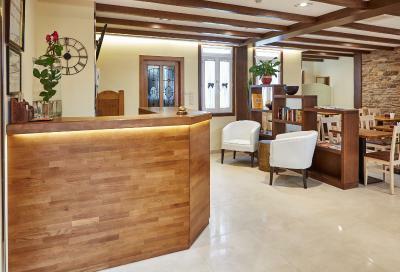 뀐 Located in the real heart of Santiago de Compostela, this property has an excellent location score of 9.6! When would you like to stay at Hostal Mapoula P.R.? 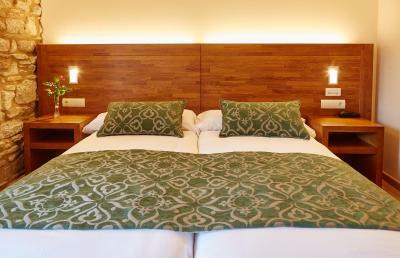 This room has 1 double bed and features a warm and rustic décor. It comes with air conditioning, free WiFi, satellite flat-screen TV, telephone and a mini-bar. The private bathroom comes with a hairdryer and free toiletries. 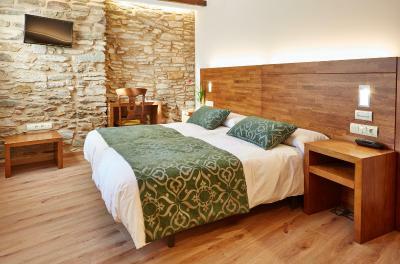 This room has 3 single beds and features a warm and rustic décor. It comes with air conditioning, free WiFi, satellite flat-screen TV, telephone and a mini-bar. The private bathroom comes with a hairdryer and free toiletries. This exterior facing room comes with 1 double bed and features a warm and rustic décor. 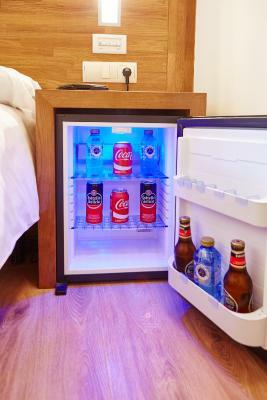 It comes with air conditioning, free WiFi, satellite flat-screen TV, telephone and a mini-bar. The private bathroom comes with a hairdryer and free toiletries. 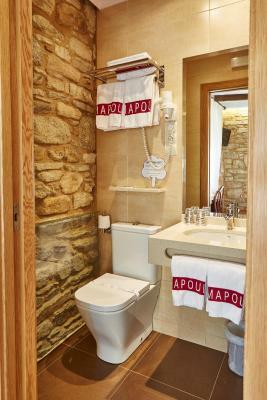 This exterior facing room has 2 single beds and features a warm and rustic décor. It comes with air conditioning, free WiFi, satellite flat-screen TV, telephone and a mini-bar. The private bathroom comes with a hairdryer and free toiletries. Overlooking an interior courtyard, this room has 1 single bed and features a basic and functional décor. It comes with heating, free WiFi, satellite flat-screen TV and a mini-bar. The private bathroom comes with a hairdryer and free toiletries. Overlooking an exterior courtyard, this room has 2 single beds and features a basic and functional décor. It comes with heating, free WiFi, satellite flat-screen TV and a mini-bar. The private bathroom comes with a hairdryer and free toiletries. 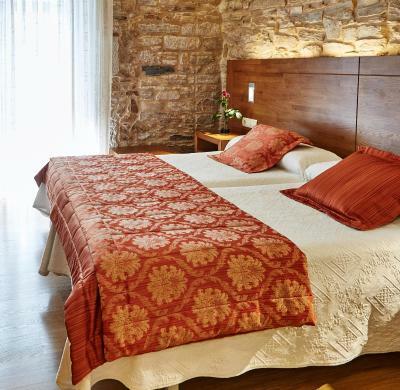 Overlooking an interior courtyard, this room has 1 double bed and features a basic and functional décor. It comes with heating, free WiFi, satellite flat-screen TV and a mini-bar. The private bathroom comes with a hairdryer and free toiletries. 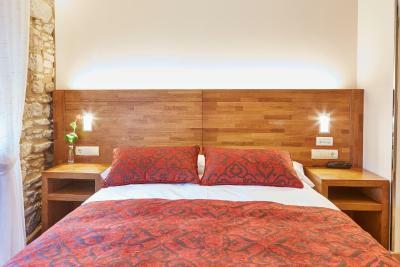 This room has 3 single beds and features a basic and functional décor. It comes with heating, free WiFi, satellite flat-screen TV and a mini-bar. The private bathroom comes with a hairdryer and free toiletries. Fitted with a triple room and a twin room, this family room features a warm and rustic décor. It comes with air conditioning, free WiFi, satellite flat-screen TV, telephone and a mini-bar. The private bathroom comes with a hairdryer and free toiletries. 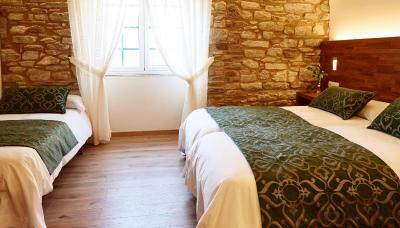 Overlooking a calm interior courtyard, this air-conditioned room features 1 double bed, rustic décor and free WiFi. The private bathroom comes with a hairdryer and free toiletries. There is also satellite flat-screen TV, telephone and a mini-bar. 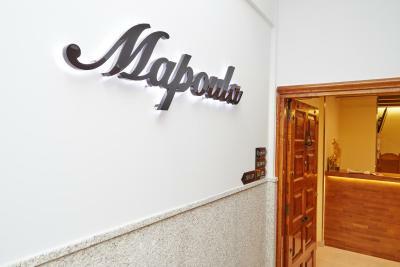 4 reasons to choose Hostal Mapoula P.R. House Rules Hostal Mapoula P.R. takes special requests – add in the next step! Hostal Mapoula P.R. accepts these cards and reserves the right to temporarily hold an amount prior to arrival. See all guest reviews for Hostal Mapoula P.R. Newest Reviews for Hostal Mapoula P.R. Bed was quite comfortable, has a small fridge with some beer and water for purchase. It was adequate for an overnight stay. Merkezi bir konumda, central location, i would recommended it. Breakfast... Espresso coffee machine for “real coffee” maybe? This was a really nice place to stay. 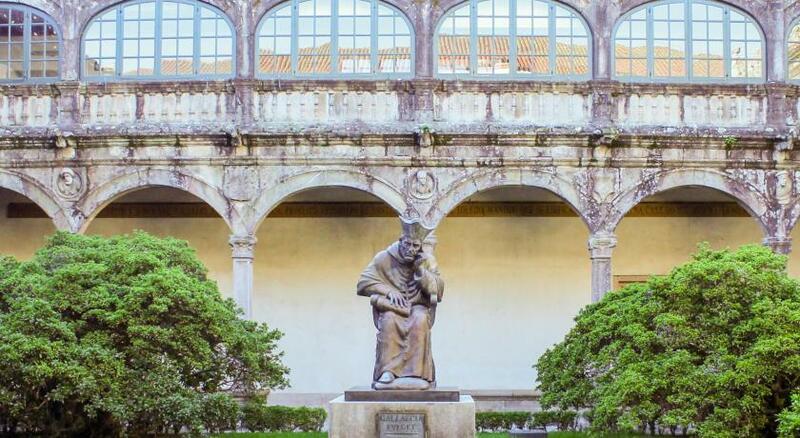 It's got a great location just in the old part of town near the Plaza de Galicia where the airport bus stops. It's maybe 5 minutes walk to the cathedral. 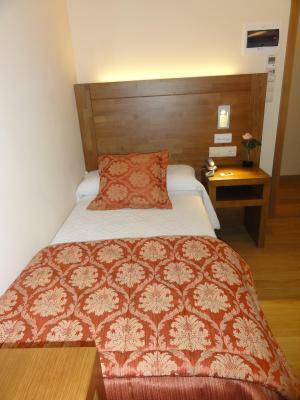 The room was modern, clean and comfortable and the staff was friendly. It's excellent value at the price we paid. The room was a bit cramped and over looking a courtyard where other people would stand and smoke meaning smoke would filter into the room. Also the courtyard is a hive for mosquitos. Great location minutes walk from the cathedral and bus stop too the airport. Noise carried well from both street and building. A very nice and helpful staff. Good localization, around 7 minutes from the Cathedral and 2 minutes from the bus that goes to the airport. The bed was very comfy, loved the pillow. Very centric location and just one minute away from the airport bus. Quiet room and good value for money.